Creativity is an important part of life, and having a clear and simple way to organize the tools of creativity is just as important. Sprout’s art and craft storage cabinet has a place for all your art supplies, and will make every OCD organizer’s heart happy. 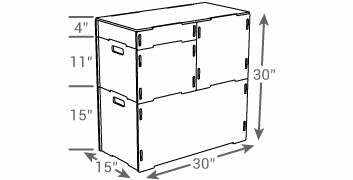 Made in the USA of quality Baltic birch, the wood art and craft storage cabinet is durable and will last for years. It comes in multiple colors and finishes, and is compatible with all the items in our stacking crate collection for an endless possibility of organization options. The stackable storage bins assemble quickly with our patented tension lock tool-less technology, and dissemble just as easily for convenient flat pack storage. "We welcomed the storage cabinet about two months ago and I am still raving over its simple yet well thought out design. Really is perfect for our organizing needs."